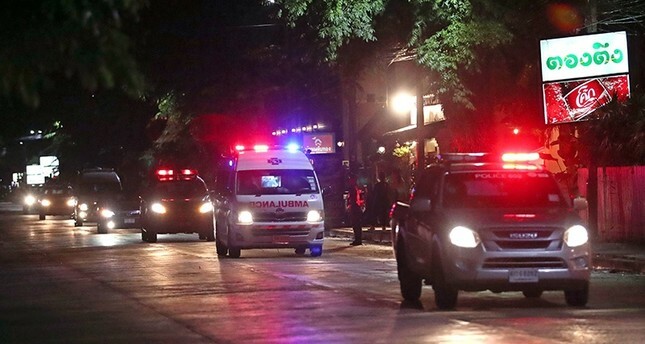 Six members of a Thai schoolboy football team have been rescued from the flooded cave where they had been trapped for more than two weeks, a local rescue official said on Sunday. Authorities in northern Chiang Rai province began the dangerous mission to bring out the 12 boys and their coach earlier on Sunday. Four children who were rescued have been safely delivered by helicopter to the hospital in Chiang Rai, head of the rescue operations said. He said the operation is going better than expected, and that the team would need about 10 hours to prepare for the next stage. He added that the healthiest boys were taken out first. About 90 divers -- 50 foreign and 40 Thai -- are involved in the operation to remove the boys from the cave, he said. Officials said Sunday morning that "today is D-Day." But the governor supervising the mission said earlier that mild weather and falling water levels over the last few days had created optimal conditions for an underwater evacuation that won't last if it rains again.